Seattle Symphony President & CEO Simon Woods shares his favorite recordings of the Schubert’s Symphony No. 5 ahead of concerts on January 26–28. The talented young American conductor, James Feddeck, will lead Schubert’s Fifth Symphony on January 26, 27 and 28. We love this symphony for its luminous Mozartian lyricism and its apparent simplicity, but as so often is the case, something that appears simple on the surface has traps lurking to trip up those who underestimate it. It turns out that bringing such innocent expression to life requires both great technical accomplishment and extraordinary finesse. Written in 1816, when Schubert was 19, and after Beethoven had already written eight of his nine symphonies, Schubert’s Fifth contains barely a phrase that couldn’t have been written 25 years earlier. Scored for a pared down classical orchestra (just a single flute, and no clarinets, trumpets or timpani), and conceived in a conventional structure and idiom that Haydn or Mozart would have found familiar, it lays claim to being the very first “neo-classical” work in music history. Schubert’s 19-year-old genius was first and foremost melodic — he had already written many great songs, including Erlkönig and Gretchen at the Spinning Wheel — and the Fifth Symphony is anchored on a string of inspired, fresh melodies that are entirely vocal in conception. And therein lies the clue to a successful performance of the work: a search for Beethovenian drama will be fruitless, but embrace the natural breath and phrasing of the human voice, and you will find in Schubert’s melodies a journey of deeply internalized joy. Schubert’s later works peer into the human psyche in sometimes frightening ways, but in the Fifth Symphony the joy is still untarnished — a welcome escape and grounding for us in the contradictory and conflictual times we live in. I always enjoy approaching music through the lens of great recordings, and in the case of Schubert’s Fifth, Sir Thomas Beecham’s recording from 1959 has always been held up as the gold standard. (The historians among you will remember that Beecham was our Music Director from 1941–44!). Going back to it as I write this I’m finding it still deeply musical, but a little less dynamic in spirit than I had remembered. I much prefer Nikolaus Harnoncourt’s recording with the Amsterdam Concertgebouw Orchestra, which is as lovingly phrased as Beecham, but much more fleet of foot. Harnoncourt, whom we lost last year at the age of 87, sadly never appeared much on this side of the Atlantic, but was one of the greatest masters of our time, bringing the repertoire of the past to life in new and endlessly insightful ways. 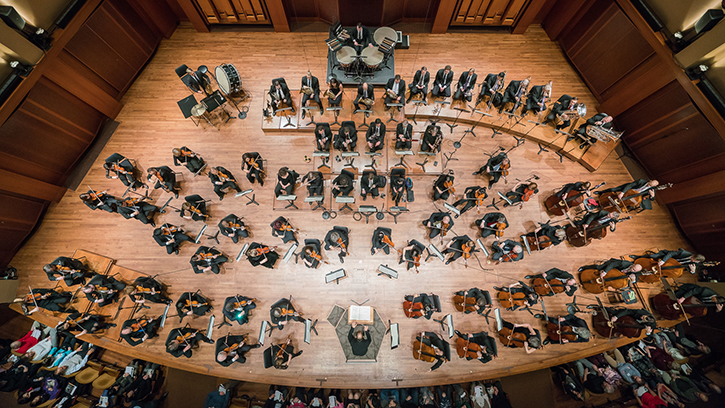 Conductor James Feddeck leads the Seattle Symphony in performances of Schubert’s Symphony No. 5 on January 26, 27 and 28.